His Building Blocks: Abbey Meets More Family for the First Time! 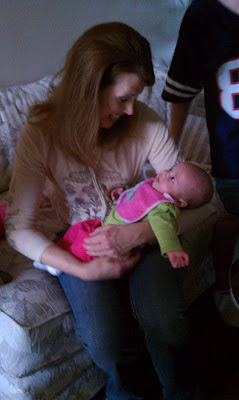 Abbey Meets More Family for the First Time! I am really behind on blog posts. So, I am going to be rapid-firing posts over the next couple of days during Luke's nap time to catch up on journalling what's been going on around here. 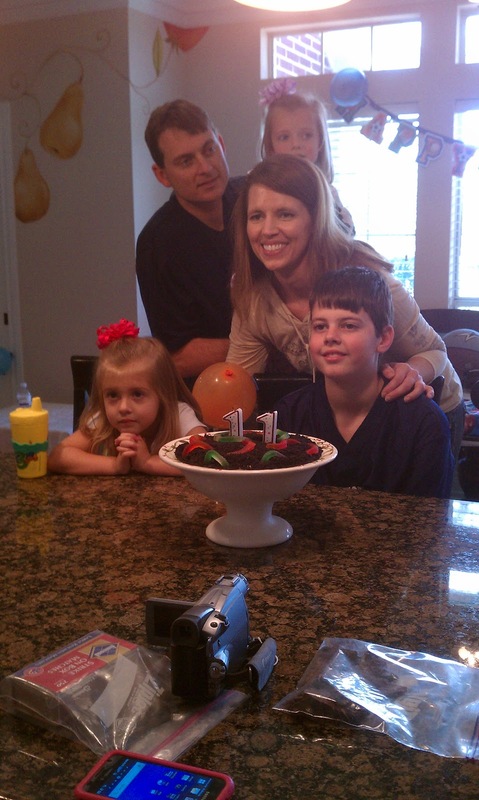 A few weekends ago, we visited Drew's parents and sister and family in the Houston area to celebrate our nephew, Mitchell's, 11th birthday. I can't believe he is already 11 years old! He has grown up so quickly. It was also the first time that Abbey would meet Drew's sister and her family. We have found that with a newborn and a two year old, packing for trips is very difficult. Each child has their own "things"--some physically necessary and others (like Luke's puppy and blankie) emotionally necessary. Between trying to remember all of the necessary items, we completely forgot to bring our camera on this trip. I am making a list next time for Drew and I to check off. However, thanks to technology and our smart phones, we still captured some photo memories. 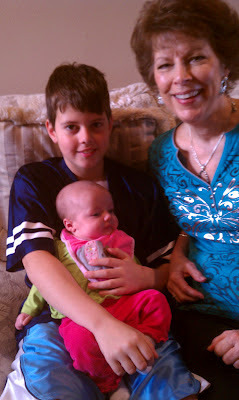 Of course, the quality is not as good as our camera, but I am glad we still snapped some pictures. 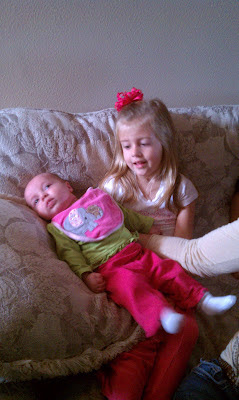 Audrey was excited to "hold" Abbey for the first time. Abbey really liked her cousin, Mitchell. 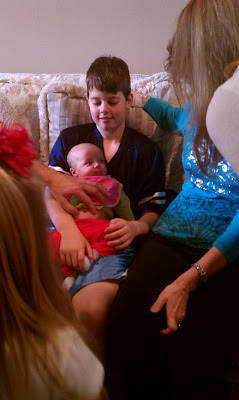 In this pic, Abbey is getting lots of lovin'. 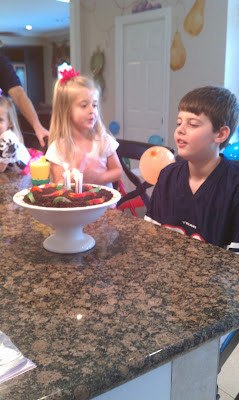 Mitchell is getting ready to blow out the candles on his "dirt" cake. Luke loved the cake and kept saying the worms were "funny". 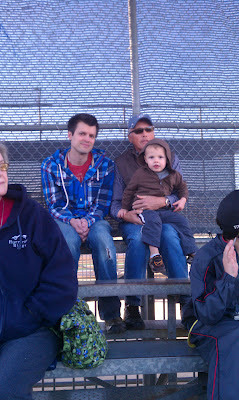 After the party, we were able to watch one of Mitchell's pre-season baseball scrimmage games. Luke loved this. I was surprised that Mr. energizer bunny was able to sit still for so long during the game. That right there shows you how much he enjoyed it! He also learned a lot about the game of baseball from the time we were there. When we returned home from the trip, he wanted to get his baseball tee set out and play. He also got out Drew's old childhood baseball glove and now asks to play "catch". He reminds us how he kept yelling "go Mitchell" during the game. Luke sometimes even throws out some of the terminology he learned, like "strike", while he plays with his baseball set. 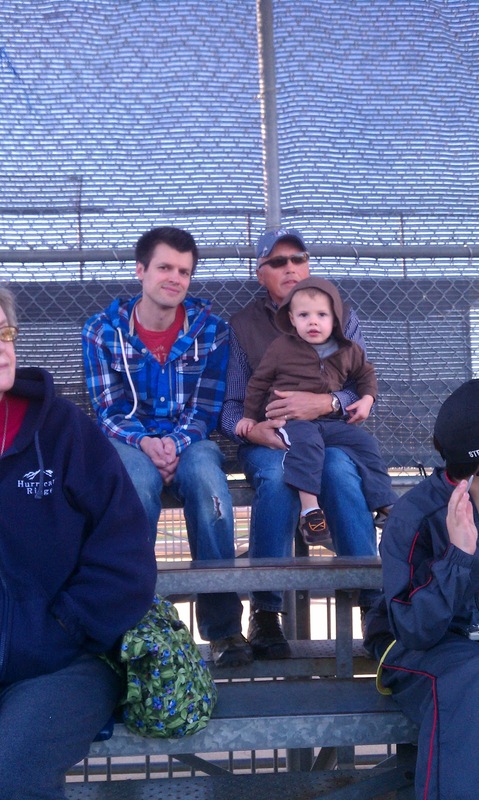 Three generations watching the baseball game. We had a great time in Sugar Land, TX and look forward to seeing our Texas family again soon!